Community InRoads is honored to be the recipient of the Cummings Foundation $100K for 100 grant! We will be using this generous donation to enhance the effectiveness of our Cultural Inclusion Program. The Cultural Inclusion Program for Nonprofit Boards capitalizes on the talents of local Latinos and "people of color" by offering them training in board governance and matching them on a board. The program emphasizes creating board environments that are welcoming and inclusive so that all have a voice at the table. This past May Community InRoads graduated 15 extremely impressive recruits who will offer their leadership talents to enhance the effectiveness of local nonprofit boards of directors. The Cummings grant will help us continue the program and to provide the resources for Community InRoads to monitor their placements and to help their new boards engage the talents of their new board member! Hats off to the Cummings Foundation and all they do for our community!! Community InRoads’ Program Director, Lysbeth Noyes, was honored by our friends at Asperger Works at their annual Dinner of Hope. 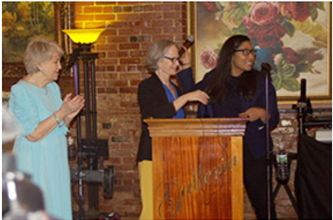 It was a well-deserved recognition of Lysbeth for her work helping to train and develop Asperger Works' Board of Directors along with volunteers Stacey Leibowitz and June Cowen Sauvageau, CEO of NILP. Lysbeth also matched them with volunteer Yvonne LaGarde who helped them with a grant template.